I spent my Saturday in Lincoln, Nebraska dodging herds of Cornhusker fans on the kickoff of college football season. As a member of the Kansas City Roller Warriors All Star team, Lincoln is a frequent stop during our season, and because Lincoln’s venue is located downtown, close to the University of Nebraska, there are plenty of great restaurants within walking distance for hungry derby girls and football fans alike. After our bout was over, several of us decided to head out for a bite to eat before hitting the road back to Kansas City. We scoped out the restaurants that weren’t washed over in Nebraska red and found Yia Yia’s, a cool pizza place that had a billion types of beer and some crazy-delicious pizzas listed on the menu. Several of us decided upon The Milano — a pizza topped with oil, herbs and capers, chicken (which they happily left off for us vegetarians), lemon juice, onion, spinach, and parmesan and mozzarella cheeses. The Owl turned to me as we dug in and brainstormed a pizza of our own: a fennel, arugula, lemon, and mozzarella pizza. So for dinner tonight, we tried it, and I’m thrilled to say it was a huge success. So successful, that I had to share the recipe. We’re big fans of grilling pizza, which gives the crust that delicious smoky flavor. Since that’s always the base of our pizza, that’s where we started. The rest just fell into place. Make your favorite pizza crust. I usually use Tyler Florence’s crust recipe, though tonight I made my crusts with a naan bread recipe. It works just as well, but has egg and a bit of garlic in the crust. I make smaller, individual-sized pizzas, so once you throw it on the grill, let it cook up until one size is done, then flip it to let the other size cook. While the crust is cooking, prepare the fennel. Shave the fennel with a mandolin so that it’s thin, then sauté it in olive oil until the fennel is tender. Cut up one lemon and added the juice of the entire lemon, and as the lemon cooks into the fennel, season it with freshly ground pepper and a pinch of kosher salt. When it’s done cooking, set it aside. Next, I made a basic white sauce and added some extras to it to give it a kick of flavor. I started with 2 Tbsp. of butter and added two minced shallots to the butter to let it cook. When the shallots were tender, I added 2 Tbsp. of flour and let it incorporate. From there, I added 1 1/4 c. of milk and two bay leaves and let it thicken. As it thickened, I added the juice of a lemon, and kosher salt and freshly ground pepper to taste. When it’s a good consistency, remove the bay leaves and set it aside to cool slightly. Once the crusts were ready, The Owl topped them with the sauce. 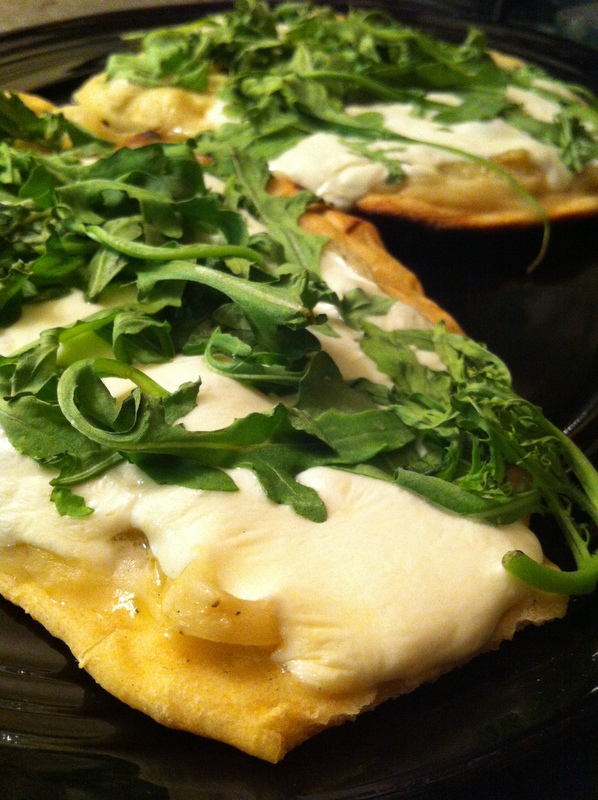 We then layered on the fennel, fresh mozzarella, and topped it with fresh arugula, put the top of the grill down, and let the cheese melt and the arugula wilt. The final product was not only delicious (hello, subtle hints of lemony brightness, the peppery flavor of the arugula, the heavenly taste of fennel, and melty, yummy mozzarella), but it was also a nice change of pace from a typical pizza. So thank you, Lincoln. You dazzled us on the first day of September. Fingers crossed, it will continue to bring us magic when the KCRW All Stars head back in a few weeks for the South Central Regional Tournament.